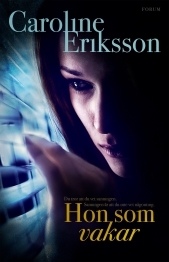 Author Elena rents a small, impersonal terraced house in a non-descript Swedish town, after a separation. Her social circle has shrunk after her recent breakup and she becomes increasingly estranged from family and friends. Her writing suffers too, as she struggles to find her feet in her new circumstances. Instead, she finds solace and a break in the monotony of her own life observing the family living across the road, the Storms. Their normalcy, and happy every-day lives, make her feel a little less lonely, cooped up in her cheerless house. But soon, things start taking a darker turn across the road, and what looks like a very ordinary family, may not be as innocent as it seems. In the midst of her angst, Elena finds inspiration again, and she starts writing. About what she sees happening across the road. About secrets in seemingly happy families. And about echoes from the past that come back to haunt the present. The more Elena obsesses over the family’s comings and goings, the more worried she grows that something awful is about to happen. Is she right to be worried? And what can she do? After all, she’s just the watcher. THE WATCHER, with parallels to Lianne Moriarty’s Big Little Lies, is a dark and tumultuous psychological drama.